An old lady with flower seeds in her hands. September. 08, 2018 07:47. by Won-Joo Lee takeoff@donga.com. Once overwhelmed by too much of stuff, you would not even want to receive any consolation because such an exhausting state only squashes any hope you would have. You might feel that there is only little you can do when you still find yourself with a bunch of work to do on your desk. You are likely to blame yourself for failing to meet your own standards. To someone else’s eyes, it may look ordinarily calm to handle everyday tasks in front of an office desk. However, sitting at the desk evokes a frequent series of despair and frustration, albeit unseen. You find it grateful to come across any unexpected consolation. It is a great comfort that sits and heals your soul as if petals were falling down to sit on your shoulders. One of the most thankful consolatory words is to remind yourself all the time that we all are living creatures, who live on earth within a definite time frame. It is only natural that there are limits to your strength and capabilities. Even under strains, every single being does their utmost for survival. You may naturally feel pity, proud and affection for them all. 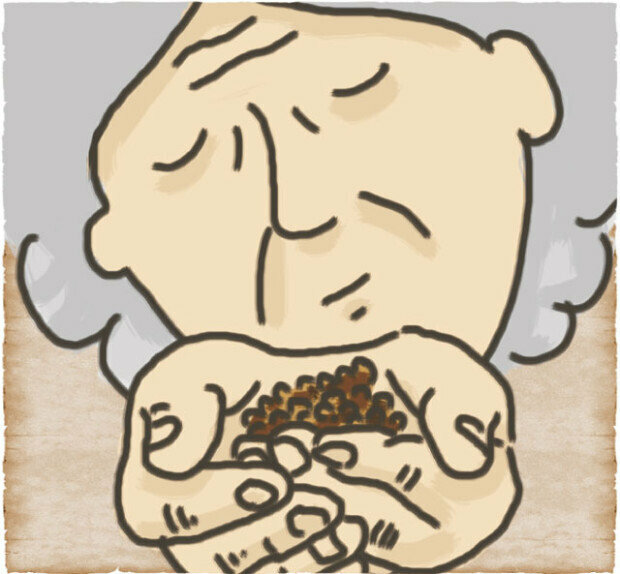 A poem written by Park Nam-su depicts an old lady who protects small living things on the ground covered with the ashes of war. War purports that something else matters more than life, but the old lady tells the opposite. Hopefully, seeds of flowers, not of war, sprout where we stand every day.